ALA Gym rising stars Rey 'Boom Boom' Bautista and Z 'The Dream' Gorres will be available to sign autographs for their fans tomorrow Tuesday starting at 5 p.m. at the Banilad Town Center, SGG Promotions has announced. Bautista and Gorres were recently featured in the highly successful 'Moment of Truth' boxing event on Feb. 24 at the Cebu City Sports Complex that drew more 20,000 spectators. The event was covered by Philippine media giant ABS-CBN and was beamed live on TV throughout northern America, Europe, Middle East and Asia. In the main card, Bautista made short work of Marino Gonzales sending the hard-jawed Mexican crutching in the canvas in the 3rd round with a single body shot to capture the WBO Intercontinental and Youth superbantam crowns. 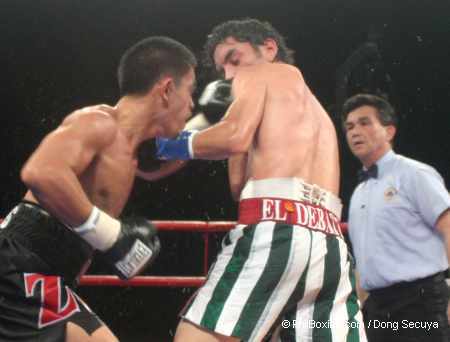 Rey 'Boom Boom' Bautista (left) hits Marino Gonzales with a body shot from his left hand that sent Gonzales to the canvas to end the contest. Photo by Dong Secuya. Z Gorres (left) hits Fernando Montiel with a left to Montiel's face while controversial referee Samuel Viruet looks on. Gorres' constant sniping disfigured Montiel's face after the end of the bout. Photo by Dong Secuya. In the co-feature, Gorres suffered a heartbreaking controversial split-decision loss against reigning WBO superfly champion Fernando 'Cochulito' Montiel of Mexico. Even with the loss, the stylish Z Gorres' popularity had soared throughout the world and with a great display of boxing skills and fighting heart, experts have now put him at par with the world's best in the 115 lbs. divison. The two pugilists will stay at the Banilad Town Center (BTC) Lobby with the fans for 30 minutes for autograph signing starting at 5:30 pm.m and then proceed to the Fight Club, located at the 2nd floor of BTC, to continue the signing there. Boxing fans are invited to come and rob elbows with the young boxing phenoms. Tomorrow's affair was organized by ALA Boxing Gym to thank boxing fans for their undying support to Cebu’s young boxing talents.